I noticed the GPX file has over 7000 points. Would it be necessary to filter\edit the number of points to a certain level? Of all that lot, those are the only ones that need to be there. Looks like a track that's been converted to a route at some point. Better to use it as a track, so it appears as a line rather than a zillion waypoints, or as Ningishzidda suggests, create a Route containing only those necessary for navigation. 7000 points for what? Is that the whole Euro Velo route, or just part of it? What sort of distance? If you are using a large number of points, it would be more useful to convert it to a GPX track, not a GPX route. Also from that image in your post, you could simplify the track a lot, without losing detail. There's no need to have lots of points for a straight road. About 1/5 of the points should still follow the road well enough. You can use Garmin Basecamp to convert it to a track, then use the filter option to simplify it. The supplier of the GPX has simply converted a recording. Shame on them. A half decent Org will do some work to de-complicate the multi waypoint track into something a Garmin will use without confusing the recipient. Its OK to issue the big GPX, cus some Garmin users like to do their own adaptions, but FHS, there are Garmin novices out here who are still unsure about editing GPXs. But that works both ways. 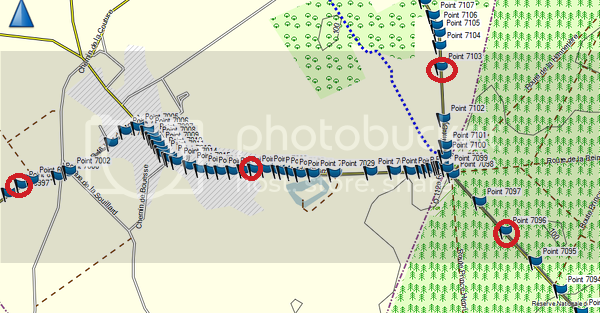 Should an organiser assume that some riders don't know one end of a GPX file from the other? Or should the rider assume that some organisers don't know one end from t'other? Because both are true, but if everybody keeps falling over themselves to make life easier for the other fellow, that way madness lies. I think that there are more variables at the rider end - different GPSs, different routeing preferences etc - and therefore it is principally down to the rider to adapt (or adapt to) whatever is made available. each of which may or may not be required to be reduced to 500 points. So the simplest answer, when having to provide just one thing, is a single GPX file that contains one or more tracklogs each reduced to 500 points and split at a logical point (half way usually). GPS savvy people will then be able to munge it into whatever they want, but the average person just wants something to upload to their GPS and go. The most arrogant Org will issue several TomTom ITN files and let the riders convert them to Garmin usable files. The most respected Orgs issue a routesheet and no electronic GPS files. The remaining Orgs do their best to keep the riders happy with a wide varying quality of GPX files, and there is always someone who complains. Is the approach I've used: A GPX 'track' that follows the intended route as accurately as possible (in practice I generally end up piecing together cleaned up segments of recorded track logs and/or tracing an OS map), with sufficient resolution that it is unambiguous when overlayed on a map. I'll filter to 500 points as a convenience for GPS users, but if you want to get clever, the line on the map is canonical and you can roll your own data from that. I certainly wouldn't bother providing a navigable Route for any device but my own. I don't know what software or maps you're using. 'Should an organiser assume that some riders don't know one end of a GPX file from the other' probably in my case, this would be true. What is the advantage of planning a 'route' as opposed to a 'track'? You won't need to use Basecamp ever again. If you can sort out a route on Googlemaps, Tyre toTravel will transition seamlessly. Tracks on the other hand, are a line on the road that always tells you that you're in the right place. It takes half a second as you approach a junction to glance down and see if you're turning off here (in much the same way as you might check a routesheet) and at any point on the ride you can look at the Garmin and see that you're on-track, which is reassuring. So for me, tracks won. Remember though, you don't have to choose between tracks or routes (on most modern GPSes) as they can do both. Display the track on the map and have it prompt you by following the route. Saying that, I've all but abandoned routes in favour of just displaying a track on a map now. I tried it and couldn't believe how awful it was. Oh well, it takes all sorts, I suppose.